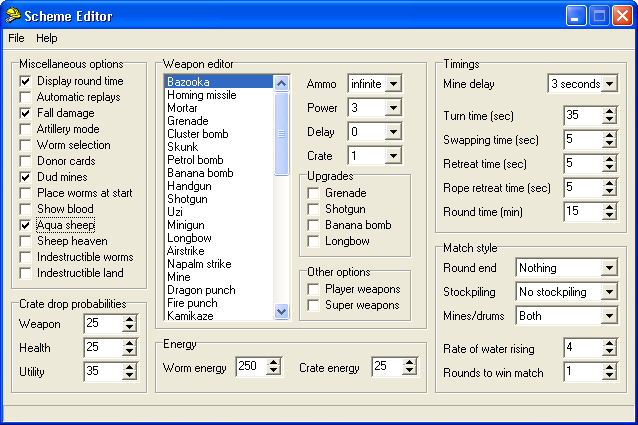 SchemeEd (also known as W:A Scheme Editor) is one of the first external scheme editors for Worms Armageddon. It is compatible only with Version 1 W:A schemes, and so effectively became obsolete when Version 2 schemes were introduced. Setting a scheme with this program is rather simple, everything can be set using input text boxes, chosen from drop-down menus or toggled with checkboxes. Some of the settings were rather limited, such as the mine fuse couldnt be set beyond 3 seconds, water rise rate beyond 7 turns, weapon delays beyond 9, etc. This page was last modified on 22 November 2009, at 12:33.